East African's coffee production has decreased over the last decade as a result of low levels of farm investment (time, technical skills and financial capital) and soil depletion. Improving access to know-how, quality inputs and knowledge on the safe and rational use of inputs can double the yield and protect soils from exhaustion. Yet there are no incentives for growers to expand input usage, neither is there access to financial services encouraging farmer’s investment. Coffee beans are seasonal; all input costs incur before the harvest, which means that farmers sometimes need to borrow upfront 60% to 100% of their future harvest, all of which can disappear if unfavourable weather conditions or pests and diseases surge. East African coffee supply chains are predominantly informal. Nearly all produced coffee is sold at the farm-gate through marketing outlets such as cooperatives, village collectors, brokers/agents, exporters and coffee processors. Local traders (commonly known as middlemen and/or assemblers) purchase coffee cherries from individual farmers and farmers groups whether it is moldy, immature, or discolored, and they offer no premium for quality. Most of these traders sell to other big traders or processors leaving the first hand producer with no marginal profit. For many growers, coffee is no longer an profitable business. Burundi’s altitude, plentiful rainfall and moderate climate make it the ideal location for growing high-quality Arabica coffee beans, the country’s main export product. Nonetheless, the production levels of what are primarily smallholder businesses are among the lowest in the world, with many farmers becoming more interested in cassava and banana growing, to the disadvantage of coffee production. The reason that coffee farming holds little appeal in Burundi is that the existing crop is 60 years old on average, meaning that smallholder yields are decreasing each year. Growing methods are also outdated and the coffee plants are blighted by pests and disease due to a lack of knowledge about cultivation and fertilisation techniques. Additionally, inefficient management practices in the farming businesses have a detrimental effect on the quality and quantity of the beans produced. As a result of these factors, yields fluctuate markedly, from 5,000 to 38,000 tonnes per year. Furthermore, it is not always possible to implement effective quality assurance measures at the coffee washing stations, as operators often lack knowledge about how to control pests and prevent disease. In addition, the error-prone nature of the system means it is not always possible to trace the beans supplied by the farmers, leading to mistrust between farmers and local washing station operators. All of this combined create a situation of uncertainty, which frequently deters farmers from investing resources and finance in the crop. The Republic of Rwanda is at high elevation, with a temperate tropical highland climate - ideal conditions for growing coffee. After major ethnic strife in the mid-1990s, the country is striving to rebuild its economy, with coffee and tea production being among its main sources of foreign exchange. 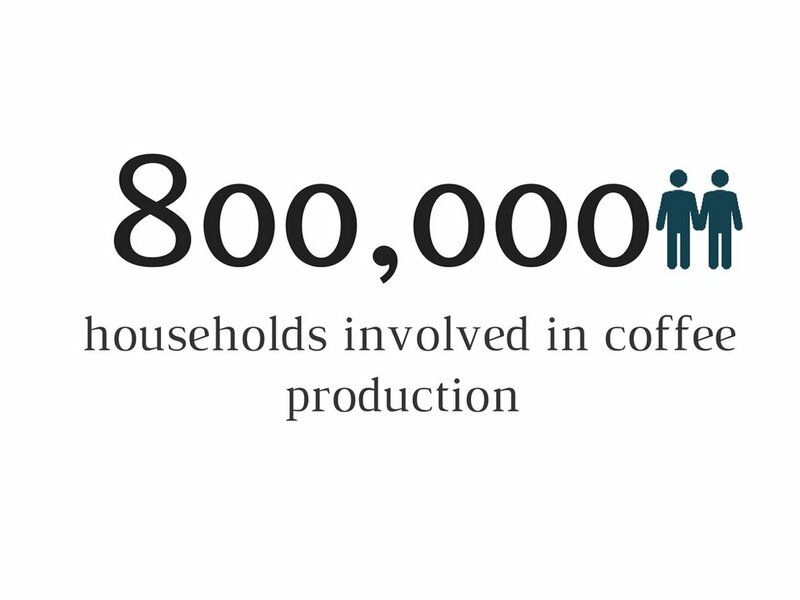 Coffee is a cash crop ensuring the income and jobs of at least 400,000 smallholder coffee-farming families. Nearly two thirds of the population live below the poverty line. The Government of Rwanda’s policy ‘strive for self-reliance and dignity’ has led to the decision to transform all Rwandan coffee into high-quality, high value products in an effort to increase the incomes and reduce poverty among smallholders. However, the overall coffee production has been fluctuating and the local currency experienced strong devaluation. Uganda counts more than 1.7 million smallholders coffee farmers, 98% of which are small family farms of averaging 300 trees and 0.20 hectare. Only 20% of the family plot is dedicated to coffee, yet coffee provides 50% of the annual household cash income. Despite a steady increase in global demand, Uganda’s coffee production has declined, keeping smallholder coffee farmers below UN's threshold of $1.25/day.